Hanoi (VNA) – A book presenting assessments of Vietnam’s economy in 2018 debuted at the National Economics University (NEU) in Hanoi on March 25. 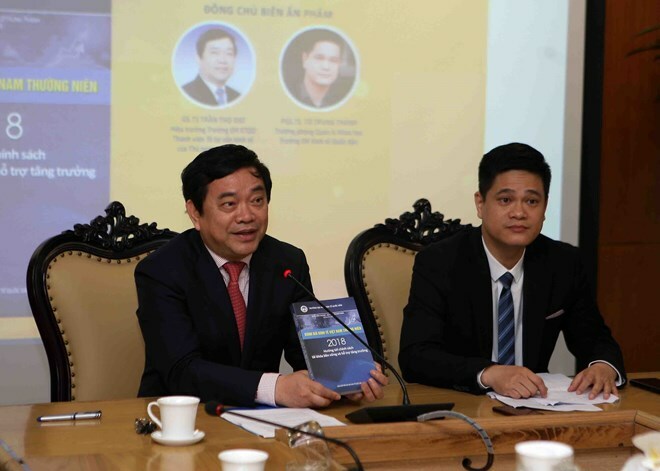 The book was launched during a national symposium on Vietnamese economy in 2018 and prospects for 2019, with the participation of many domestic and international scientists and economic experts. According to one of the authors, Assoc. Prof. Dr To Trung Thanh, the publication delivers the viewpoints of NEU experts on economic issues throughout the year, serving as a useful reference book for its readers and especially policymakers. The book features assessments on the development of the Vietnamese economy in 2018 and its prospects for 2019, as well as analysis on the country’s fiscal policy (including budget collection and spending, budget allocation, and public debt) and its impacts on the economy. It also puts forward solutions towards sustainable fiscal policy, facilitating national economic development. Participants of the symposium stated achievements and issues of Vietnam’s economy in 2018, as well as opportunities and challenges to support policy recommendations in economic management this year. They also proposed suggestions in fiscal reform, aiming to ensure a safe and sustainable national finance, contributing to growth. Addressing the event, NEU Rector Prof. Dr Tran Tho Dat said that in 2018, Vietnam’s economy recorded a growth of 7.08 percent, the highest figure in over a decade, while the quality of growth has also been improved. The development of the national economy is attributable to the processing and manufacturing industry within the foreign direct investment sector, along with domestic consumption and trade surplus in spending, he added.